Electronically sign documents in a clutter-free and easy way with additional benefits of syncing your digitally signed documents to your cloud services. The authenticity of a document is of utmost priority when it comes to NDAs, confidential reports, financial statements and contracts. Usually, the exchange of such critical documents is accomplished through scanned documents but doing the same using just an app will make things a lot easier and manageable. If you are someone who’s responsible for critical documents and nothing goes through without your signature, it must be a nightmare to individually sign each document. Several enterprises and businesses are now accepting digitally signed documents as an effort to remove the clutter of piles of pages, effectively increasing the productivity. Digital signature apps enable you to add your electronic signature to any kind of document. 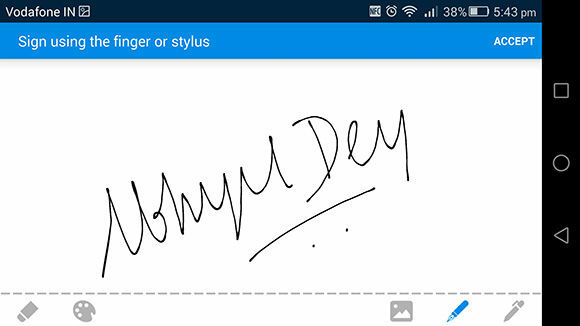 SignEasy was launched on the App Store quite some time ago and now it is available on the Play Store. 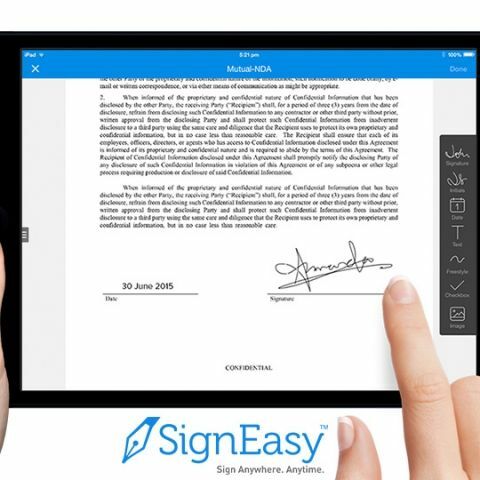 Although there are other players like SignNow, DocuSign and Adobe eSign Manager DC, signing documents is a breeze with SignEasy. Attachments from email and documents from your cloud services can be imported directly to the app where you can use your fingers or a stylus to electronically sign them. Documents can be imported from apps which support the “Export” or “Send To” options. The app also lets you store these signed documents directly to your connected Cloud services such as Box, Dropbox, Evernote and Google Drive. SignEasy supports many document formats such as Text, Word, Excel, PDF, HTML, JPEG and more. 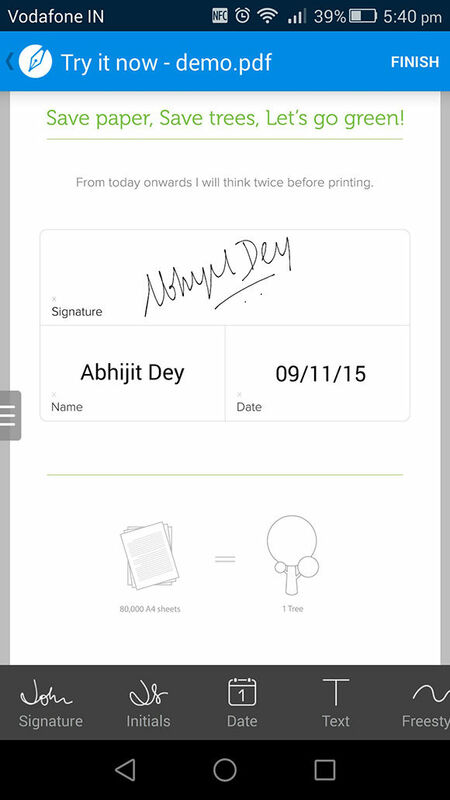 You can store your signature on the app locally and simply add them to any document that needs to be electronically signed. Along with adding electronic signatures, you can also add your initials, text, current date and images. The app doesn’t save your signature and initials on their servers, probably for security reasons, and are stored on your device. Storing our signature on the cloud could be added later, secured with an authentication layer. It does sync your stored drafts and your signed documents, and you will always have the option to download your signed documents from your cloud services if you upgrade to the Pro or Business plan. This app might not seem useful for individuals but if you own an organisation or a startup, the practice of using electronically signed documents can be introduced. The app is a free download on Android and consists of all the features from the Pro plan for a trial period of 7 days. After that, you won’t be able to send over electronically signed documents but sometimes if they are generous enough, you might get a single credit to transfer over a crucial document. You will lose all the features that make the app functional so you will have to resort to upgrading to one of the plans. The other plans include a Business plan and a Pay as you go option. The Pay as you go option seems quite useful if you’re aren’t sure whether you’ll be using the app more frequently. The Pro account will cost you around Rs. 2,458 for a year’s subscription while it costs Rs. 4,917 for the same duration. The Pay as you go feature will let you electronically sign ten documents and includes all the basic features, costing you around Rs. 318. SignEasy is available on Android, iOS and BlackBerry. A Star Wars fan and sci-fi enthusiast. When I'm not playing games on my PC, I usually lurk around the Internet, mostly on Reddit. Which is the best app of android? Which is the best app of Android ? Which is the best app of IOS ? which is the best health app of Android? Which ia the best app of gymnasium in Android? which is the best gaming app of android in 2014?